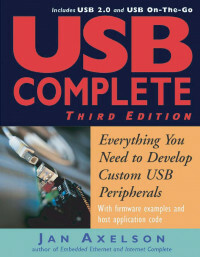 This book is for developers who design and program devices that use the Universal Serial Bus (USB) interface. My goal is to introduce you to USB and to help you get your devices up and communicating as quickly and easily as possible. The USB interface is versatile enough for a wide range of peripheral devices. Standard peripherals that use USB include mice, keyboards, drives, printers, and audio/video devices. USB is also suitable for data-acquisition units, control systems, and other devices with specialized functions, including one-of-a-kind designs.